What would happen to the world should the human race vanish in some fantastic fashion ? 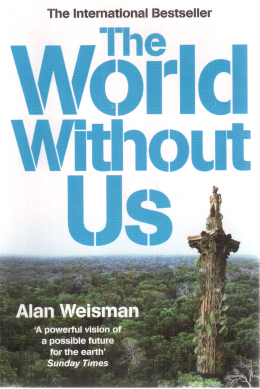 The World Without Us, by Alan Weisman discusses the effects our creations and environmental modifications have had upon this planet. By chapters and stages he meets with experts and academics and describes the types of failures, breakdowns and decomposition of the articles of man. He describes in detail how shortlived our property is and in turn how insidious and overwhelming some of our by-products are. One particular Chapter ( 9: Polymers are forever ) left me with the impression that we will be choking to death on the remants of our packaging or products long before nuclear waste and emissions ever effect us. The scale of the damage to our environment through plastic is mindblowing! Has the book made me a better environmentalist ? no, but it had adjusted my view as to some of our environmental priorities.